The Geologic Overlook trail is located in Red Rocks Park near Denver, Colorado. The trail begins at the Lower North Parking Lot where it travels up to a geologic marker. From there it backtracks a bit before continuing through a picnic area then up and over a ridge behind one of Red Rocks tilted sandstone cliffs. The trail ends at the Upper North Parking Lot where hikers can either loop back to where they began by passing through a tunnel or by hiking down the Funicular trail. To get to the Lower North Parking Lot find your way to Entrance 1 of Red Rocks Park where you can continue driving up the parkway to the lot. The trail begins near the northeast corner of the large parking area. From the parking area the trail travels about a hundred yards or so and crosses the road below the tunnel. After crossing the roadway it continues straight ahead and travels either through or around the gate, depending on whether it is open or not, where the trail continues on the left. The trails departure from the road is well marked on the other side of the gate. The deer in the area seem well accustomed to people. The trail reaches the access road again that leads to the picnic area where it crosses and finds a short spur that leads up to the Geologic Marker. The marker is well worth the little bit of extra effort it takes to hike up to it not only for the great views but for the wealth of information that it provides about the nearby geology. The knowledge obtained will enhance the overall experience helping to make the hike even more enjoyable. After backtracking down from the Geologic Marker the Geologic Overlook trail continues up a short set of stairs and past the picnic shelter. There are a few improvements as the trail starts out to help stabilize it including steps made from beams to aid the hike. A more primitive section comes up as the trail scrambles over the ridge on an uneven surface. 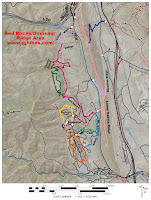 This is the type of trail that will awaken the adventuresome spirit of both children and adults. As usual the reward for your effort, besides the exercise, is the elevated view of the landscape that stretches out before you. Going down the other side of the ridge the trail is fashioned much like before but with new scenes to enjoy. The trail ends across the road from the Upper North Parking Lot. From here you can cross the road and pick up the Funicular trail on the east side of the parking area or hike along the road to the left through the tunnel. The tunnel has room for pedestrians on one side although it isn't a lot of room. Waiting until no vehicles can be heard approaching and then scurrying through might be the safest approach. We stopped on the east side of the tunnel to take some pictures of some honeycombs in a hole in the cliff that some bees were busy at work on. Using a zoom lens gave the impression that the bees buzzing around were only inches away from my face. The Geologic Overlook trail is a nice short hike with great views for enjoying the natural beauty of Red Rocks Park. During the spring and early summer months the hills and meadows are vibrant with green grass and a large variety of wildflowers. 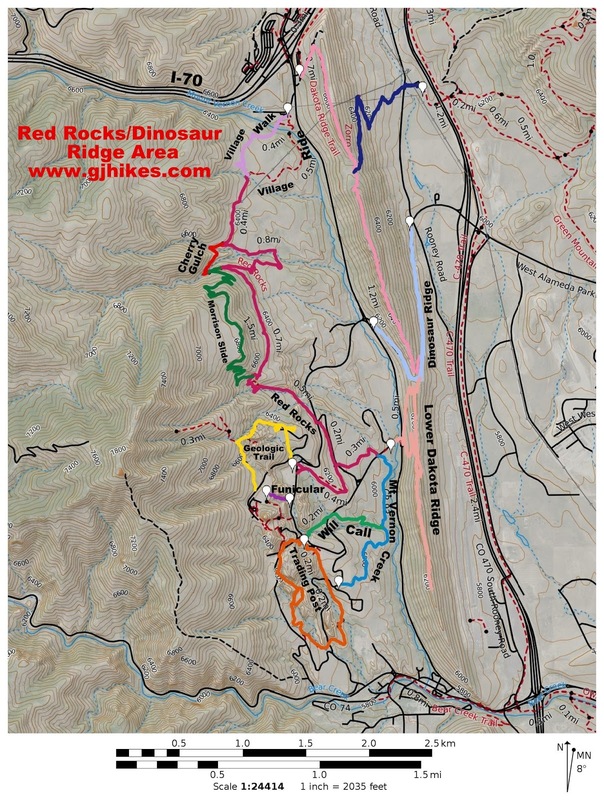 The trail lies at the contact zone between the Great Plains, to the east, and the mighty Rocky Mountains where an upheaval of sandstone has created the picturesque scene which is Red Rocks. If you would like to see it for yourself then all you have to do is 'Take a hike'.